Every pho­tog­ra­pher has sub­ject mat­ter that inter­ests them more than other sub­ject mat­ter. For me, what gets me going the most is fine art pho­tog­ra­phy and por­trai­ture. However.….every once in a while I’ll pull out my cam­era to shoot dif­fer­ent sub­ject mat­ter. Gotta pay those bills. This morn­ing how­ever I pulled out my cam­era because I was sim­ply pissed off at my city. Look at what they are doing with our recy­cling. Does THIS look like a recy­cling truck? I love Mon­treal. I find the city VERY pro­gres­sive, tol­er­ant, fairly clean and great place to live. My wife and I love it here. We are com­mu­nity minded peo­ple who believe in the envi­ron­ment and we ALWAYS recy­cle as much as we can. We wash out con­tain­ers and bot­tles and sep­a­rate papers to make it easy for the recy­cling crew. We used to see our recy­cling going into a recy­cling truck, where it would get sorted on the spot. 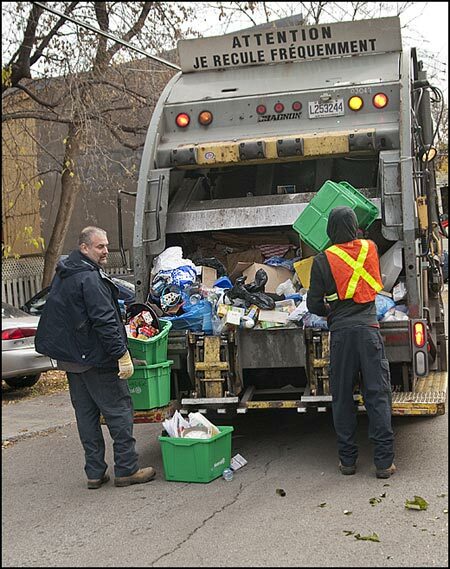 As far as I know, crunched up mixed recy­cling in a garbage truck is NOT recycling…it’s frig­gin’ garbage on its way to a landfill. Does any­one know what is going on here? I mean as much as I love to do my part, I hate wast­ing my time, and I hate munic­i­pal bull­crap. If my recy­cling is going into a land­fill, then why am I wast­ing my frig­gin’ time?